The “Take AIM” show on BlogTalkRadio, October 5, 2011. ROGER ARONOFF: Good morning, and welcome to Take AIM, Accuracy in Media’s weekly talk show on BlogTalkRadio. AIM is America’s original media watchdog, and every week we point out biased coverage and bring you the stories the mainstream media ignore. I’m Roger Aronoff, the Editor of Accuracy in Media and of The AIM Report, which you can subscribe to at aim.org. Also, by visiting that site, aim.org, you can sign up to receive our daily E-mail so you can keep track of what the media are up to. Our guest today is Tim Groseclose, a professor of political science and economics at UCLA, who is with us today to discuss his new book Left Turn: How Liberal Media Bias Distorts the American Mind. Tim has spent years constructing precise, quantitative measures of the slants of media outlets. He does this by measuring the political content of the news, and converting that content into an “SQ,” or “Slant Quotient,” of the outlet. To determine bias, he compares SQs of news outlets to the “PQs,” or “Political Quotients,” of voters and politicians. In the book, Tim contends that the general Left-ward bias of the media has shifted the PQ, the Political Quotients, of the average American by about twenty points on a scale of 100. This timely, much-needed book, and study, brings facts to this often overheated debate. Good morning, Tim. We’re very glad to have you with us today on Take AIM. TIM GROSECLOSE: Roger, good morning. Very great to be here. ARONOFF: Thank you. Let me take the opportunity to tell our listeners a little more about your background. Tim is a professor of American politics at UCLA. He has joint appointments to the Political Science and Economics departments. He has held previous faculty appointments at Caltech, Stanford, Ohio State, Harvard, and Carnegie Mellon Universities. All great conservative credentials. His research is focused on Congress, the media, and mathematical models of politics. Tim, naturally, when we saw your book, Left Turn: How Liberal Media Bias Distorts the American Mind, we were intrigued. This is our life’s work around here. We do our part to help the American mind see through liberal bias. So what was your journey in life that led you to do this study a few years ago, and to write this book, now, about liberal media bias? GROSECLOSE: I’d say a pretty long journey. I think it probably began when I got tenure, some time around 2002, I think, or just before. I decided that once you get tenure, one, that’s the time to be brave, if I am going to say something that angers liberals—as we all know, academia is dominated by liberals, you have to be careful about angering them too much.—but the other thing that I thought, Well, tenure, that’s the time you can really start a long project. When you don’t have tenure, you don’t want to do any sort of project that’s going to take longer than, say, a year, just because you only have a few years before you’re reviewed for tenure. So I thought, Okay, I’ve got it, now’s the time to do this long project. I have to say, maybe the most influential person in this whole thing has been Steve Levitt, the author of Freakonomics. He’s been a good friend of mine since 1994, and I’ve watched him. Unlike most academics, he’ll take these questions that really interest laypersons, something that a layperson would say, “I’d like to know the answer to that question.” and he’ll tackle it. So I thought, Now’s maybe the time. In 2002, I talked to my frequent co-author, Jeff Milo. It was going to be an article, just about media bias. The article would be a precise, quantitative way to measure the media bias of different outlets. We eventually published that in a peer-reviewed journal, The Quarterly Journal of Economics. That was 2005, and one thing led to another. That article was received pretty well, and I thought, Maybe there’s a book here. That was another four years or so, to actually finish the book. ARONOFF: So you were conservative, politically, before that time, but it was after you got tenure that you were able to “come out of the closet”—is that a fair assessment? GROSECLOSE: I think that’s fair. I would say I’ve been pretty open with colleagues. I think everyone’s kind of known. But this was the first time that I actually addressed the topic—“Now here’s the truth.” You guys look at media bias all the time. I’m sure what I wrote was not surprising—in fact, some conservatives have faulted me, they’ve said, “Oh, what are you going to do next time? A research project that proves the sun rises in the east?” This is a truth that conservatives kind of know. This was the first time I’d actually done research that was politically charged, that was going to anger one side—liberals, they won’t agree with you, they’ll say, “No, no, no. There’s no bias.”—and conservatives will be happy. I knew that this could anger some people, so I thought, Best to have tenure before I start this. ARONOFF: How do you deal with the question that you were biased to start—that you have your views, and thus your study was inevitably going to reach the conclusions that you’ve reached? GROSECLOSE: Ah, good point, good point. My co-author and I, we designed the study so that, actually, a computer executes it. We feed it the data—the key data we have is think tank citations. Some people say, “Who are you to judge whether a think tank is liberal or conservative?” For instance, the Brookings Institution—conservatives will often say it’s far Left, some liberals will say it leans Right. What we did was, we said, “Let’s not judge it ourselves, not depend on our own subjective judgments. Let’s look at members of Congress.” We have a way where we look at members of Congress who are citing different think tanks. Sure enough, Brookings Institution, by this measure, is kind of a Left-leaning centrist think tank. The key for our method, just for that aspect, we said, “Let’s look at think tank citations.” It’s a pretty objective piece of data—you just see if someone’s cited the think tank or not, and then you compare these citations to how members of Congress cite different think tanks. Here’s an example of one of our results: We find that The New York Times has a Slant Quotient of 74. Now, it also happens that Joe Lieberman has a Political Quotient of 74. So I’d say that 74 means he’s 24 more points Left-leaning than perfectly centrist. Our result means that The New York Times, when it cites think tanks, picks a mix of Left-leaning, Right-leaning, centrist think tanks about the same that Joe Lieberman picks when he cites think tanks on the Senate floor. I would say that everything in our method is very objective. There may be some little things. We wanted to make sure, when someone cited a think tank, they were citing it positively, and weren’t saying, “Oh, the Heritage Foundation says this, and here’s why they’re wrong.” We wouldn’t count that in our data. We would exclude that observation. To make sure that that little bit of subjectivity wouldn’t creep in, when we hired research assistants to code this data, we made sure that we had almost a perfect mix of conservatives and liberals. I actually asked them, before we hired them, “Who’d you vote for last election?” For our data, we had about half of it coded by Bush supporters, half of it coded by Gore or Kerry supporters. ARONOFF: Okay. So what about defining the terms? Is that an issue? “Liberal,” “conservative”—in other words, you have to pick issues and things, so how do you define those terms for the sake of your study? GROSECLOSE: Right. Good point. In fact, I hope people read—there’s a chapter, it’s called “P’s and Q’s of PQs” where I get into it. It turns out, when you live in Los Angeles, Hollywood people are everywhere. You just wouldn’t believe how many. Hollywood people who are not super-famous—the camera people, the writers, all kinds of producers—I talk about. One of them, a friend of mine, his name is Loucas George. Now he’s a Hollywood producer. Everyone’s heard of George Lucas, the Hollywood producer, but it turns out that there’s a guy named Loucas George, and he’s my friend. He’s actually done several television shows lot of people have seen, and he’s just as liberal as any of the others. I describe a big, long argument we had—we’re still friends to this day, but it’s sometimes a wonder. I called him an “extremist” during this argument, and he said, “No, you’re an extremist.” and then we had to have this side argument about what “liberal” and “conservative” mean—and I discuss them in the book. To answer his points, and a lot of others you mention—who am I to decide what “liberal” means?—I punt on the issue, and I use the definition determined by the Americans for Democratic Action. Now, this is a liberal group: Barney Frank has been one of its honorary chairmen, a number of far Left members of Congress have been on their board. I think everyone would agree that this is a liberal group. They pick a number of roll call votes in Congress each year, and they decide whether the “Yea” vote or the “Nay” vote is the liberal side. I just let them, so when I designed my PQ scores, the Political Quotients, they were all based on criteria developed by this liberal group, the Americans for Democratic Action. ARONOFF: How do you account for that in your study? GROSECLOSE: Yes. Thank you for mentioning that. Just to be clear, I hope that everybody realizes that, when I found them the most liberal, that only refers to their news pages. I think everyone would agree that the opinion pages are conservative. You know, I was surprised when I first got that result, but when I started digging, found the quotes from Reed Irvine and Cliff Kincaid—was it them, or someone else? No, it was someone else that said that the fact is, the division between the opinion pages and the news pages was like North and South Korea, they’re so far different. A number of other people have said, “You have happened onto a well-kept secret: The news pages of The Wall Street Journal are actually pretty liberal.” That’s what we found, at least in terms of the think tanks they’re citing. The reporters there, they are citing the liberal think tanks much more than the conservative think tanks. We even found that they were slightly more liberal than even The New York Times. It was a surprise, but now that I found it, and found a number of anecdotes, lots of people have come up to me and said, “Yeah, that’s a well-kept secret.” I should probably mention one more thing: All of that data came before Rupert Murdoch took over The Wall Street Journal, before he bought Dow Jones. So that may change after Rupert Murdoch—I suspect he may try to hire some more conservative reporters there. We’ll see. ARONOFF: Give us your take on the main media watchdog organizations, ours included. ARONOFF: What have your studies shown you about, say, Reed Irvine’s role in this whole history of the study of media bias? What’s your take on all that? GROSECLOSE: I have to say, I think all of you are doing a great service. I’ll even say Media Matters, although sometimes they can get a little vicious and attack people personally. They’re one of the worst for that—some of what they do is just reporting, but they’ll attack Fox News. I’d say that Accuracy in Media, Media Research Center, those are two excellent organizations. One thing that both of you do that I really appreciate is, often you’ll point out the things they’re not reporting. I think that’s a lot of where the bias is: They’ll say, “Here are these stories that the mainstream media is overlooking,” and it’s often these sins of omission, rather than commission, that the bias comes from. I have to say, even if we have both sides doing it, I think one great service that you guys do is, you at least alert people of it. You say, “Look: Even if everything they’re reporting is true, it can still have a bias because of these things that they leave out.” One thing that I find in my book is that this bias has a strong effect. By my estimates, the liberal bias of the media, as you mentioned earlier, has shifted the Political Quotient of the average U.S. voter by about 20 or 25 points. Now here’s what that means substantively: That’s about the difference between the average purple state voter—say, a voter in Iowa or Nevada—and the average red state voter, like a voter in Texas or Kentucky. I’d say that’s a qualitative difference, the difference between the average Iowa voter and the difference between the average Texas voter. That’s the effect of media bias. Now, what would you say about these groups, such as AIM, who point out this bias? If these groups could make people perfectly aware of [the bias], and make voters more skeptical of the media—whenever you read something, always be on guard, maybe they’re not telling us something—and very rational when they read newspapers and when they watch television, this would allow them to discount the bias much better, and that would have the same effect as eliminating the bias. So if you guys could be perfect at your job and make everyone skeptical and rational, then that would have the same effect: It would make America change from kind of a purple nation to, all of a sudden, voting and thinking something like Texas or Kentucky. ARONOFF: Okay. In that vein, talking about omission—again, that seems to be something more difficult to measure since you measure actual data. ARONOFF: Looking today, we’ve got these two stories out there: Operation Fast & Furious, and Solyndra, which, I would say, maybe this week have started to gain some traction in the mainstream media. Before this, it was mainly Fox and the conservative media, but they seem to be breaking through. It’s not necessarily liberal or conservative issues or things, but where the bias comes in is that they find them in full protection mode of the Obama administration because they’re sympathetic. ARONOFF: If these same facts were coming out about, say, the Bush administration, I think we would have all these speeches and people in full impeachment mode, and all that going on. GROSECLOSE: Oh, yeah. Oh, yeah. Same way, for instance, in my book, when I talk about the Van Jones saga, the way it came out. GROSECLOSE: Just yesterday—here’s something interesting—Joe Biden, during a speech, was asked about Van Jones. Apparently Van Jones is trying to get these Wall Street protestors to start a revolution or something. This guy’s a self-avowed Communist. But Joe Biden, he said, “I don’t even know who Van Jones is.” Well, he was the “green jobs” czar in the Obama administration. GROSECLOSE: Well, it turns out, before Van Jones resigned—now this was in the middle of the night, one Saturday night, I think they did this purposely, to keep it out of the media, or downplay it—during that week, members of Congress had started saying, “What is this guy doing in the Obama administration?” Some were calling on him to resign. There was not one word of this during that prior week, not one word from The New York Times. So, if that’s where you got your news, The New York Times, you would not have known who Van Jones was when he finally had this dramatic resignation. I’ve heard—I haven’t checked this, someone told me—that Solyndra is the same way, that The New York Times is not reporting on it, and MSNBC is the same way. If you were someone who only got your news from The New York Times or MSNBC, you wouldn’t even know what Solyndra is right now. ARONOFF: —and not really measurable, I guess, right? GROSECLOSE: Right. Now I do try to capture that. It’s very hard, and I would say that maybe I do it, at best, in an indirect way. What I would do is, I’d say, “Well, the think tank experts are mentioning these facts. If you ask someone at the Heritage Foundation, ‘Give me a quote about what’s wrong with government,’ they’d probably mention Fast & Furious and Solyndra. Meanwhile, someone at the Center on Budget and Policy Priorities—a liberal think tank—would not.” So if you just look to see which think tanks the media are citing, I think, indirectly, this is going to capture that fact of how the mainstream media is not reporting these facts that conservatives want you to know. ARONOFF: How do you see that book in the timeline of awareness of liberal media bias? GROSECLOSE: I think it’s a fantastic book. I started this project right around the time that it came out. I also have to say, I think at least two, maybe three, people gave me that book as a Christmas present. Everyone thought I should read it. I agree—it’s a great book, I’ve read it at least three or four times. It’s great. I think he would also agree with me that the key part of the bias is not them telling false statements, it’s the stuff that they fail to report. Also, I think he would say that it’s not so much a conscious attempt, not an underground conspiracy, but is partly just that it happens that almost all of the mainstream, national media is liberal. I have statistics in my book. Surveys say it’s something like 93-7, liberals to conservatives. And [Goldberg] points that out, he said, “Yeah, I was in the CBS newsroom, this is what it’s like.” Because all of their friends are liberal, and they are liberal, they often just don’t hear the stories conservatives want you to hear. ARONOFF: These figures, 93-7, you cite some of the surveys of journalists—how they vote in Presidential elections, their political donations—so how relevant and accurate do you think these studies are as evidence? GROSECLOSE: Yes, there’s been two famous studies that just asked a selection of national—actually, these were Washington correspondents—“Who’d you vote for last election?” and they typically get about 93-7. Now, as I argue in the book, not only is that Left-leaning, that is more liberal than Berkeley, California. More liberal than Cambridge, Massachusetts. In fact, the Congressional district that contains Cambridge, Massachusetts, actually voted something like 86-14 for Obama over McCain, but it had double the number of McCain voters—in Cambridge, Massachusetts—than you see in Washington correspondents. Now somebody might say, “Oh, here’s a problem: How do you know those are accurate?” I actually argue that if people could lie about this—it’s probably not that much, but suppose that when the reporters take the surveys, something like 5% are lying—it’s kind of an algebra problem, but I show that just because there are more liberals who are lying and saying they’re conservative, there aren’t many conservatives. And if you take only 5% of those who lie and say they’re liberal, the numbers are actually exaggerated. So, by this algebra problem, I can show that 93-7 is actually probably understating things. If some people are lying, it’s probably more like 96-4, maybe 97-3. I look through campaign contributions, and that’s about what you find: If you look at national journalists and see which candidates they give money to, the money goes about 97% to the Democrat, 3% to the Republican. So I think 93-7 is probably understating how liberal the newsrooms are. ARONOFF: What are the most common manifestations of bias? In other words, is it just outright fabrication? Selected use of quotes? What do you see as the most common manifestations of bias? Could you list them? ARONOFF: Could you list them? Go ahead. GROSECLOSE: I’ve been doing research on this for eight years, and I have to say, it’s very hard to find false statements. The Jayson Blairs of the world—you know, the fabricator at The New York Times—these guys, I think, are just few and far between. When they are caught, it’s dramatic, they’re fired, and their careers are ruined. So they’re not doing much lying. But, as I said, it’s what they don’t report. One, as you said, is that they’re not getting the perspectives, the quotes from experts, on the conservative side as much as a fair and balanced reporter would. Another thing that I want to point out: It’s the stories that they select. I have a chapter in the book, chapter eight, it’s called “An Alien Conservative Injected Into the Newsroom, and the Stories She Might Cover.” Now the reason I titled it that, and the reason I used “she,” is because this actually happened: The Minneapolis Star Tribune, as an experiment, said, “Maybe we should hire a conservative. Let’s see what happens at our newspaper.” I interviewed her. Her name is Katherine Kersten. I just talked to her about the stories—what goes through her mind when she selects a story. A lot of people just think, “Oh, these stories are selected for people.” as if nature tells you, “Here’s the stories you’ll do.” Well, no, that’s not quite right: These journalists have a lot of leeway about what stories they want to pursue, and this Katherine Kersten gave me some really good anecdotes about what goes through her mind. By the way, if anyone wants to read about her, you don’t even have to buy my book. If you just Google “Power line blog,” these guys, the Power Line guys, they published that chapter. It’s all about Katherine Kersten. It turns out they’re friends with her. So people can read that chapter without even paying for the book. GROSECLOSE: So if you Google, probably, “Groseclose” and “Kersten,” I bet it would be at least in the first pages. Look for powerlineblog.com. ARONOFF: Right. Power Line’s a great blog. I read it, too. So what about labels? How often do we hear, on newscasts, people labeled “conservative,” versus people labeled “liberal?” And how about “arch-conservative” and “ultra conservative” versus “ultra” and “arch-” on the other side? GROSECLOSE: Ah, yes. That is a factor, too. I have another chapter where I do a case study of an article in The Los Angeles Times. It turns out they looked at diversity in admissions, and they picked UCLA. Unfortunately for that journalist, I was on the faculty oversight committee for admissions at UCLA when she wrote it. She wrote this article which I thought was just incredibly biased. As I argued, I didn’t think one sentence was false, but I was just furious at the article. Finally, looking at it for false statements, I didn’t find any, but I realized that the problem was the things she wasn’t reporting. So I listed all these facts that she did not report, facts that a conservative would have wanted you to know. I also looked at who she quoted. It turns out, she found these two really far Left students on campus, another far Left professor, another couple of people who I know are Democrats in the UCLA administration, and quoted only one conservative—that was Ward Connerly, one of the authors of this Proposition 209, which disallows race from being used in admissions. The interesting thing is, when she quoted the five liberals, she did not give a political label to them, but when she quoted Ward Connerly, she said, “Ward Connerly, the conservative author of Prop. 209 . . .” I thought that was another asymmetry they did. Now one thing where that is captured, when I did the think tank citations, if someone did that, called a think tank “the conservative Heritage Foundation,” or called it “the liberal Center on Budget and Policy Priorities,” we would actually omit that from our data, if they gave it an ideological label. But I looked: It turns out there’s a definite asymmetry. They did that more to the conservative think tanks than they did to the liberal think tanks. ARONOFF: One of the great lines that I’ve cited, which you have in your book, is when Evan Thomas, a Newsweek editor, in 2004, during the election, said something to the effect that the media were worth a fifteen point advantage for John Kerry, and, later, when Howard Kurtz pressed him on it, he said, “Well, maybe five.” But I think that is one of those—they often refer to “gaffes” as when people accidentally speak the truth. Where is that? Tell us about how you see this current election season we’re in, and what we’re headed for, and what people might look for in terms of liberal bias during this upcoming Presidential campaign. GROSECLOSE: Ah, right. I actually think that during the campaign season—it’s just casual observation, I haven’t done a systematic study of this—they’re not quite as bad. The mainstream media is not quite as biased as during the other times. I think where they’re most biased is when they’re reporting things that are pretty subjective, and it’s hard for a person to detect the bias. When it comes to a campaign, I think often these media outlets, because they’ve got this stark contrast—a Republican and a Democrat running at the same time—can kind of see it when they’re giving more compliments to the Democrat than they are the Republican. Now I think they do do that, but I think it’s not as bad as during the rest of the time, when they’re just talking about policies. So if it’s some sort of green jobs policy or something, they’ll talk about what angels and saints they are, the people doing this, and then, meanwhile, when we find something that looks like a kind of cronyism, they’ll not report that. But the key is that any time they report something negative about a politician, about a Republican, just keep in mind that that newsroom was probably 93-7 Democrat to Republican. They have more incentive to report bad things about the Republicans. Always just keep in mind, “Well, there’s probably some good things about this guy that they’re not reporting.” Also there are also probably some negative stories about these Democrats that they’re not reporting. So you, you always have to be on guard for that. ARONOFF: Yes, and you see how they constantly try to sort of foment a controversy between and among the Republican candidates, and to keep talking about “Well, look, the Republicans, obviously they’re not satisfied with the field because now they want Chris Christie, or Sarah Palin—or whoever they’re talking about—so I think it shows through pretty clearly. So, let me ask: Before Fox News and talk radio and the Internet and CSPAN, conservative voices were really excluded from the national news media dialogue, I would say. Conservatives were almost viewed as these sort of creatures that need to be studied, but their voices shouldn’t be heard. So isn’t, in some way, this a kind of a golden age for conservative voices in that we are heard and seen, and people know where to look and listen to find conservative voices? Has that altered the landscape of liberal media bias? GROSECLOSE: I think so. In fact, in some ways—here’s what I’ve noticed during this promotion on my book, that’s been so remarkable: That it can kind of feed on itself. Here’s the idea. For instance, while I’ve been promoting this book, I don’t think there’s been one news outlet with a slant quotient to the left of 50 that’s even mentioned my book. I’ve been on Fox News several times, been on several talk radio stations, several Internet outlets like the Daily Caller and PJTV, but have not seen like—you know, you’d think like The Los Angeles Times, here they have a professor in their backyard, he’s written this book that’s gaining some traction, but they haven’t mentioned one word about it. The New York Times will not review this book. Now, I kind of knew this would happen. But when I was writing the book, I have a literary agent, and she told me, “Yeah, you’re not going to get reviewed in The New York Times. But,” she said, “look, there’s all these new outlets out there, you know. A lot of them are web-based things like The Washington Times. There is a market for this, and because of this, conservative books are actually selling.” One thing that’s really heartened me is that I think I would have written this book anyway, but this helped cement my idea that Yeah, I can write this, the fact that there are these conservative outlets that can talk about my book. I’d like to think that because I wrote the book I have actually given more news stories for these conservative outlets, and even people like the Tea Party. Here’s something to think about: Often, when conservatives protest something, the mainstream media doesn’t want to cover those protests. So if you’re a conservative protester, you think, Do I really want to waste my time going out and doing this protest when no one’s going to cover it? Well, if all the sudden there is a Fox News, and there is a talk radio, you might actually do the protest where you might not have otherwise. I wonder if this Tea Party movement might not have happened if we didn’t have Fox News and talk radio. So meanwhile, because of movements like the Tea Party, and people like myself who will write these conservative books, all of a sudden there’s more material for Fox News and talk radio to cover. So you can kind of see how this builds on itself, and it makes Fox News have more interesting stories, which, maybe, allow them to have more viewers and listeners. You could almost even imagine, at some point, that the moderates are going to say, “Wow, this is some interesting stuff on Fox News and talk radio that I’m not hearing a thing about on the other side. I’m going to start watching Fox News and listening to talk radio more.” So I hope this will happen, this kind of feed-on-itself notion. It could really help things, help the conservative movement and the conservative news outlets. ARONOFF: So have you even heard from, say, The Today Show, or Piers Morgan’s show, or any of these shows to at least say why they’re not having you on to talk about your book or reviewing your book, or do they just pure shun you? GROSECLOSE: Not a word, and even like, as I mentioned, I have that case study on The Los Angeles Times. I thought at least they might. GROSECLOSE: The other thing, if I could add: The mainstream media, the one thing I point out in my book is that it’s not just Left or Right. There’s a continuum. There’s like kind of far Left news outlets—MSNBC—there’s sort of far Left, like The New York Times, but then there’s some that are just almost like Left-leaning, centrist news outlets. Something like the News Hour with Jim Lehrer, I would argue, is one of those. Good Morning America is one of those. Maybe even USA Today is not that far Left. I thought maybe one of these kind of Left-leaning, centrist mainstream media outlets would interview me, or talk about the book. Still, not a one. Nothing from them. Amazing. ARONOFF: One surprise is that you talk about the Drudge Report, and you list it as being right down the middle, I guess a 50 or something. GROSECLOSE: Right. But that would be the one exception. Yeah, that’s the one. Actually, I found him slightly Left-leaning. He did mention, I should say, my book. ARONOFF: But what’s a little confusing is, what he is. He’s really more of an aggregator of news stories. ARONOFF: It’s the selection of the stories that he puts up there, and the pictures that he highlights, rather than being a creator of news content. ARONOFF: —so how does he score that way in your study? GROSECLOSE: —and ABC News, so he’s basically linking to a mix of the mainstream media. Now, some, it’s conservative media, but because it’s so much a mix of the mainstream media, I’d say it’s almost like an average of the total media, but for that reason he’s going to look at least Left-leaning and, by my measure, he’s probably a Left-leaning centrist. That’s what his Slant Quotient is. One thing I should say I think he’s good at: Sometimes these mainstream media outlets, they will kind of bury the headline—there’ll be this conservative fact, this fact that conservatives are all interested in, that’s buried in, like, the eighth paragraph—and Drudge will make it the headline. If I went back and found a way just to judge the headlines that Drudge reports, I think he might be Right-leaning, centrist, just by the headlines, but by the actual text of the things he links to, I find that Left-leaning, centrist. ARONOFF: So what about popular culture? In other words, episodes of Law & Order, or even Bill Maher’s Real Time, which I guess you don’t consider news media or anything. Did they figure in, as your book is subtitled A Distortion of the American Mind? GROSECLOSE: I think so. I think so. Yes, so I’m here to promote my book, but if you’ll allow me a moment, I want to promote another one, Ben Shapiro’s—I’m looking at it on my bookshelf right now. I’ve read maybe a couple chapters. Excellent book. This is a kid who entered UCLA when he was something like fifteen or sixteen. We overlapped a year. I still haven’t met him, but I really admire him. This was a kid—I know for a fact that UCLA is a very liberal institution, so I really admire any student who can emerge from UCLA as a conservative, who can stick to his or her values, and Ben Shapiro did. I think he’s now a talk radio host but he’s written a book called Primetime Propaganda and I would urge people to look at that. That also distorts people’s views. He talks about Friends episodes where, children outside the institution of marriage, they just treat that as this normal thing. I’m convinced he’s right, that that distorts people’s thinking and changes people’s views. Someday I would love to try to do something similar, to try to think of a way to measure that type of propaganda objectively and try to measure it. I still haven’t quite thought of a good way to do it. Maybe someday. But I think the other—the third—institution you haven’t mentioned yet is education. I think our universities are at least as bad as the media in terms of being dominated by liberals, and, I think, maybe at least as bad in having a strong influence. I see it in kids: They come here conservative, but it’s very hard for them to stick to their values after four years of this kind of distortionary influence from their professors. ARONOFF: I want to mention that I had Ben Shapiro on this show a few weeks ago. That whole transcript is up—just as this transcript will be up probably next week, or some time. We’ll have this as a podcast and a transcript in case anybody’s missed part of it, and Shapiro’s is up there. It was a fascinating interview on what he did and his methodology, and all that. Just a couple of other things—one you mentioned before, about Biden and Van Jones, we have a couple of things on that on our website today, if you wanted to see that at aim.org. So, just a couple more things. What are the most, today, egregious, in your mind, ongoing examples of liberal bias? In other words, what’s galling you these days? Anything in particular you can point to? GROSECLOSE: Oh, gosh, I’m sure I’ll think of something. GROSECLOSE: —and I thought some of the student government at Berkeley responded by saying that they passed a resolution that no one should use race in distributing things on campus. They were saying this affirmative action bake sale was violating this resolution. Well, I thought, if that’s true, your resolution would make that bill in Sacramento also illegal. They just don’t realize it. I think that the truth is obvious, but because of these ideological reasons, people kind of want to be blind to it. I see those students, the people in the student government at Berkeley, the legislators in Sacramento, and then some mainstream media, and I think that this bias is actually distorting our ability to speak and think truthfully. So I’d say, lately that’s my latest pet peeve. ARONOFF: We’re just about to wrap it up here, but one of your acknowledgments in the book is Ronald Reagan. GROSECLOSE: I’m glad you mentioned that. That’s about the last line of the book, thanking Ronald Reagan—like a lot of your listeners, he’s a hero of mine, someone I greatly admire. It turns out that, when I was trying to get this book published—this is my first book—when I was writing, I was a novice, a rookie at writing books, and I had a problem actually getting publishers to read my proposal. So I had a literary agent, I was shopping it around, they said, “Well, you can’t get anyone to treat it with urgency. They kind of know that you’re a rookie, and that no one else is going to treat it with urgency, so they put it on the back burner and say, ‘Oh yeah, I’ll get to it, I’ll get to it.’” Finally, an associate at the literary agency that’s representing me had a great idea: “What we should do is shop this around at CPAC, the Conservative Political Action [Conference].” This is an annual event. People might have remembered Colonel Allen West, now Congressman Allen West, from Florida, was the keynote speaker last year. I think the year before it was Glenn Beck. So it’s a place where conservatives gather. Well, it’s becoming known as a great place for conservatives to shop their book proposal. Publishers are starting to get it—that conservative books sell—so they are going to that place. So his literary agent said, “Okay, well, that’s what we’ll do. We’ll shop it at CPAC.” Now, she had the great idea to tell these publishers who were sitting on my proposal, “Hey, we’re going to shop this at CPAC. You need to read it very quickly or we’re going to find another publisher. Finally, St. Martin’s Press, my publisher, said, “Okay, yeah, we’ll read it real quick.” Now, it happens that CPAC probably wouldn’t exist—or definitely would not be as popular as it is today—if Ronald Reagan hadn’t decided to attend those sessions, that conference, multiple times during his Presidency. So the last line of the book says, “Not only did Ronald Reagan make 300 million people more free and prosperous, he also helped me to find a publisher.” It’s hard to thank him enough. GROSECLOSE: Great. So, the book. I have to say, I’m a big fan of Amazon, so it’s in some bookstores, but Amazon.com, I think that’s probably the best place to find it. I’m a huge fan of Amazon. I’d also encourage people, please, go to my website, timgroseclose.com. It’s a hard name to spell. If you can’t remember it, if you just Google “UCLA political science,” you can find my name, and you can get directed to my website. But I talked about Political Quotients, and I have a page on there where I have a 40 question quiz. Everyone can compute their own Political Quotient. I think that’s kind of fun. Also, there are a number of links to different media I’ve been on, some Fox News interviews, some Web-based interviews, and, also, a few pages that give kind of a summary of the book. I encourage people to go there. ARONOFF: Our guest has been Tim Groseclose. Your website, I guess, is timgroseclose.com, right? ARONOFF: Okay. 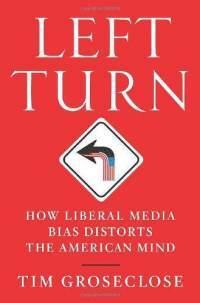 The name of the book, again, is Left Turn: How Liberal Media Bias Distorts the American Mind. Tim, thanks so much for being with us today on Take AIM and, as I mentioned, some time next week I’ll put out a piece on this, and we’ll have a podcast of the full interview along with the transcript. Good luck with the book. Thank you so much for doing this work. We think it’s important too. We will be back next week, or the week after, with another episode of Take AIM. Thanks a lot. GROSECLOSE: Roger, thank you. It’s been a real pleasure. ARONOFF: You bet. Thank you. So long.